Well, here it is. The final of the 2015 song contest. An intriquing guided tour of the history and highlights of Vienna is our introduction. A big ball for the theme of building bridges, where it lowers from the ceiling of the arena - shades of New Year's in New York? The ORF Radio Symphony Orchestra accompanies a violinist for a glitzy introduction of Conchita, who rises from the stage, dressed in an equally glitzy magenta outfit. 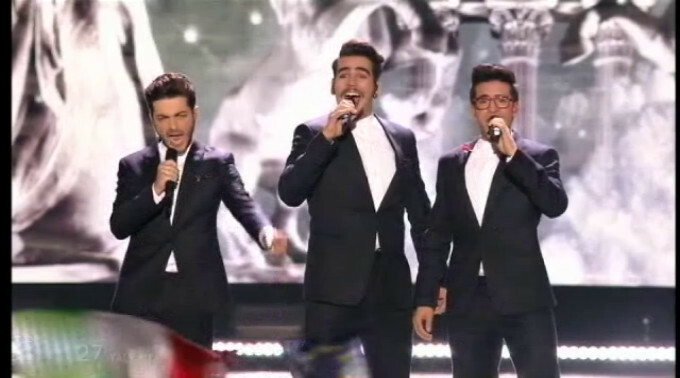 It is the same three hosts, who sing their way onto the stage as Conchina flies across the arena on wires. It's so over the top. But it doesn't stop there, the Vienna Children's Choir - with a group of boys in sailor suits (remind me, isn't Austria land-locked?). Some other bloke (I didn't see a caption for him) comes in to lower the tone. Thankfully his part is short. Proof the Conchita can do just about anything. Well. That was something of a way to open the contest. Now as before, they're announcing all of the entrants, so this gives me a moment to pop out and grab that box of Churros that I forgot to pick up earlier. There will be no pictures tonight. The contest is expected to finish at midnight-thirty-five at which point I'm going to crash. Update: Pictures now done. A rather sweet video of people around the world interacting with each other in impossible ways. And this contest is apparently being hosted as "a green event", though there was no further information on what that means. Also, for a first (maybe a world first? ), the song contest is being broadcast live in China. I wonder what Chinese viewers will make of... well... most of the entries. D'you think she wears the headphones to bed? In the shower? Oh, okay, it's the oddballs with the headphones. Hello China - hope you enjoy this. The weird voice and the air violin and the headphones. Just as batpoop nuts as before. This won't win, but I have a feeling that it will do reasonably well and everybody will be like "Whuh?". You can't deny she gave it her all. Here's a dramatic French power ballad like every other dramatic French power ballad (can't imagine it? just think of Céline Dion). A quiet beginning with a dramatic looking war torn style backdrop with snow that rises up, doves that rise from the ground. The song means don't forget. We've been tracking slowly down this shattered town in the video screen and as the song kicks into high gear, four drummers are accompanied by dozens of ghost drummers. Quite effective. It ought to fare better than France's entry last year, which is best left unnamed (and forgotten). The gold winged shoes and the really silly "boy band" song. It seems quite popular in the arena, but it is epic mood whiplash coming after France's entry. 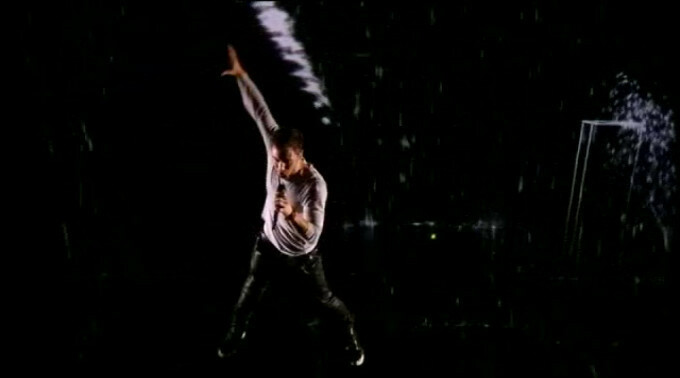 I don't like the song much, but fair dues to the man, this is even more enthusiastically performed than last time. This ought to do well. Before I leave, let me show you Tel Aviv. Hey, moron, she's kinda of pretty. You should have woken her up. Oh, it's the spooky eyed (or totally wanting him) girl, with the film noir effects. It is staged nicely. I like this song. Starting with the bloke not wanting to wake up the girl and smiling to the dog. Big cheer in the arena for the introduction of the girl who really rather wished that he had woken her up. Now together on stage, staring right at each other. There's some chemistry going on here, even as she says lying here naked and staring at the phone. It is a simple and fairly repetitive song (I didn't want to wake you up ... why didn't you wake me up? ), but it is staged well. I've only heard this one in the promos in the semi finals. Will a twenties style swing number do it for the UK this year? Wow, native English speakers shouldn't have lyrics that sound that forced. But perhaps the biggest criticism that I can throw at this is the lead pair barely move. They are totally shown up by the backing dancers. They ought to have moved more. Still, it is a better entry than... many that the UK has entered recently. That is not a compliment, mind you. Um, guys? Get a room much? Oh, the bouncy song with the mid-song smooch. This one was fun. It is silly and it knows it so is just going to crank it up to eleven. I mean, banjos too. The girl dragging the bloke around the stage, and talking to the audience. A crowd pleaser, and the perfect antidote to Armenia. 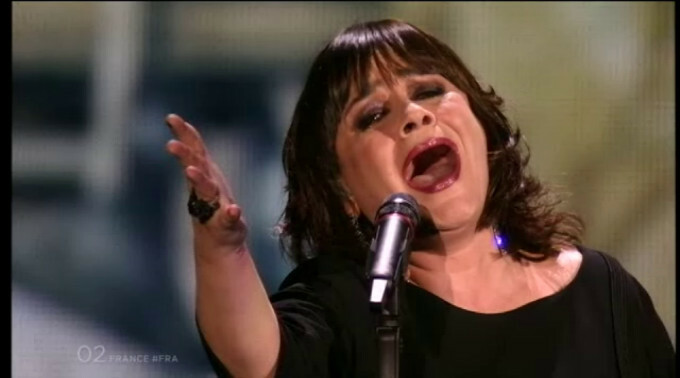 The rather voluminous Serbian woman belts out a perfect and damn powerful rendition of her song. I don't get the Molitva vibe from this performance, but this will surely place top three. If you think this was peculiar, the promo video takes this to eleven, though I prefer the live version. It's like Kirsty MacColl crossed with the girl from Ginger Snaps for the freaky confession song. I like this, and I'm really not sure why. Maybe I'm just attracted to weird - and this is that. Gentle, emotional, and bizarre. How many synonyms for strange can I come up with in one song description? It's a lovely performance, and I've just noticed, they concentrate on the song and their performance - the video wall barely does anything. Better than in the semi final, this was a great performance. A quick cut out for brief adverts, so I can stop and restart the PVR so I can record at 2000kbps for a better picture. You might have noticed the pictures are better looking? The potential winner with the lovely interaction of the video wall. Not much to say, I was watching the song. Here's the second top three placer, if not the winner. It was difficult to place songs in the semi final. There are a couple of forgettable songs this year, but picking out of all of these strong and deserving songs is going to be really hard. There's something like 27 songs, and I can only assign points to ten. This is going to be difficult this year. Such a sweet and gentle song, with appropriate staging, and an effective supernova for the "I should have been there for you" (makes sense in context). I just hope this song isn't underrated and scores lower than it deserves, but it's a strong year this year. Will we see Australia again? Or will it be China (!) next year? Okay, well here it is. Australia with prop streetlights. I think this is one of the weaker songs, to be honest. Maybe Australia's problem is in entering a conventional pop song? This ought to shift a few digital downloads, but win? Nah... It's a strong year. Did I mention that already? Talking of what I meant about not entering something conventional, here is a great example of something artistically different. I can imagine this is going to be a Marmite song - it will be liked or loathed with no middle. Me? I quite like it. 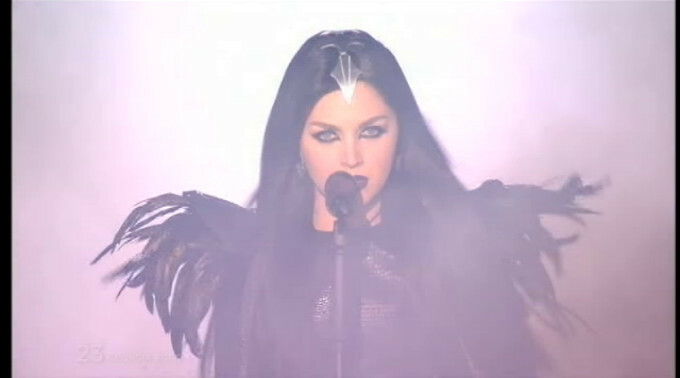 No way in hell this is going to win (though Eurovision has surprised in the past), but it is a performance. 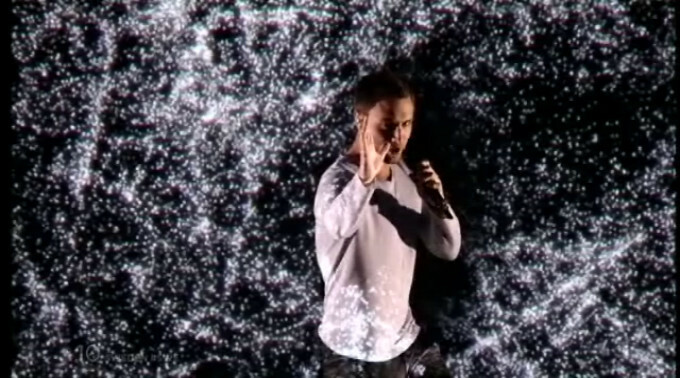 The backing dancers just bring to mind some sort of futuristic dystopia. Thank goodness they aren't wearing red or it would just scream A Handmaid's Tale! How many pianos did they go through in rehearsals? A long haired bloke plays piano and sings (in English). Drums and bass guitar come along later. Lots of hair. And just to make the song more interesting, the piano (which he is still sitting at!) is set on fire. Uh... Okay. That's different. 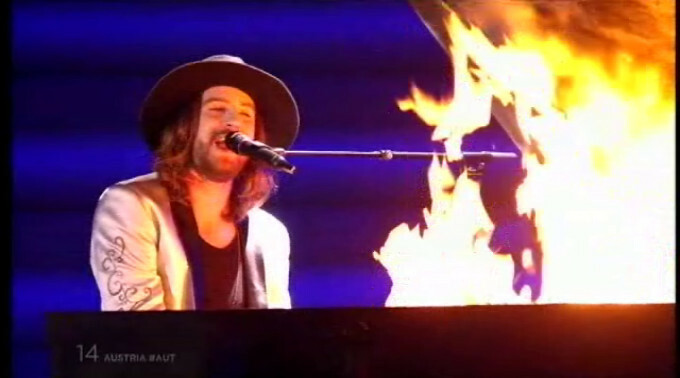 Lead singer walks away as the piano is well alight (and the piano sound continues, so it was on the backing track). Conchita in the "green room" - I suppose some broadcasters are going to adverts. What is the secret of her dress? Superglue? 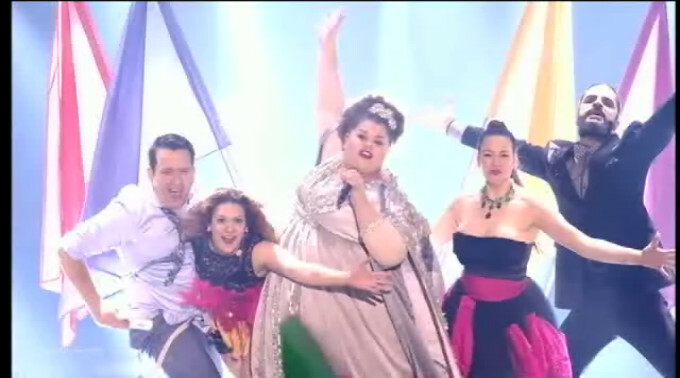 A power ballad of the traditional Eurovision style, complete with wind machine. It takes long enough to reach the climax. I guess that's the last breath... This is noisy and powerful but comparing it against Serbia, Sweden... I don't think so. We're up to song sixteen for the second song that isn't in English. It's the moving statues. 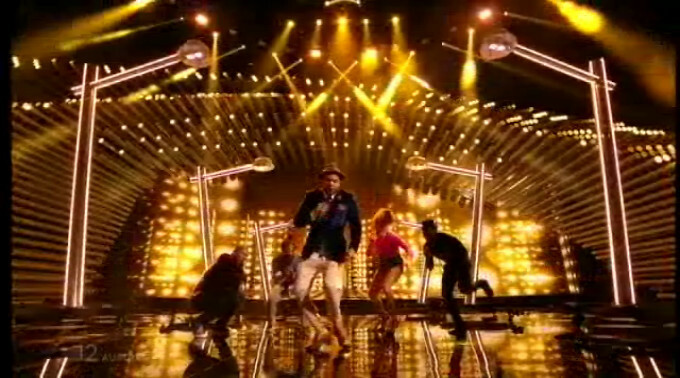 The staging is quite effective, and the man can sure carry this song. For the postcard, she's "skiing" in a wind tunnel. Huh? Strange voice. Cross Adele with headphones-girl from Slovenia and that's sort of what this sounds like. Insanely high heels, an open back catsuit, hair in a bun... Umm... Shouldn't they have just given her a whip or something, or would that have been a bit too Helga Geerhart? The billowy fabric on the videowall is distracting. One person determined that paralysis is not going to get in the way of performing. And perform she does. Another strong ballad. So damn many this year! Whoa. Okay. Turn up the bass and enjoy this... experience. This is sort of like a ballad given a modern makeover. That ought to do well. Some say that Romanian is the closest living language to Latin. As is usual with these sorts of studies, others dispute the claims. Ah. De La Capat is the name of a charity that the band are associated with that aims to help children abandoned after their parents leave the country. Now the song makes a lot more sense, and the suitcases and black and white pictures of children on the videowall. It's kind of sad, really. 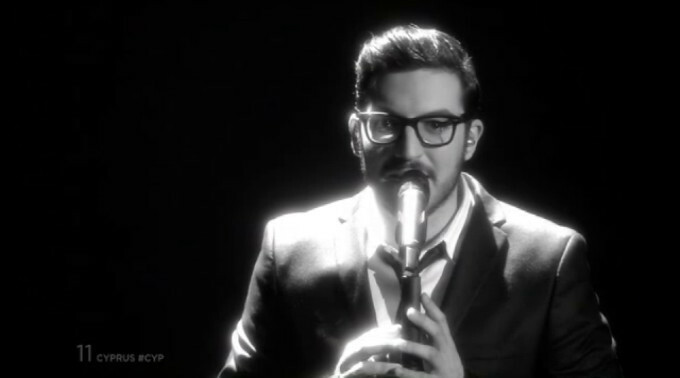 And it is a well performed song (in Romanian and English). I really hope this does well. It's an "old Europe" entry, so it will be in their own language. In this case, Spanish, and my Spanish is poor nonexistent but doesn't amanecer mean daybreak? Little red riding hood? Actually, it is a dress with a tail about ten metres long, this is leading up to... yup, a costume change. Wow, doesn't she look like Britney Spears during the dance segment? Another power ballad, but sorry, mi corazon feels this is a bit repetitive. I've seen some of her "flashmob tour" videos; yes, she's itty-bitty. Oooh, it's the amazingly gentle sweet song. If I could nominate a winner, this would be my pick. This and the Italian entry are the only songs I have as MP3s on my phone. No more writing, sorry, I'm just going to enjoy this lovely song. SO much smoke at the start. Oops! Oh my. The next song is warrior goth girl. Was the running order random? Another song that sounds really repetitive. The warrior has been in danger for too long. With wind and maybe a little bit too much smoke. Were you paying attention to the song, or the dancers? 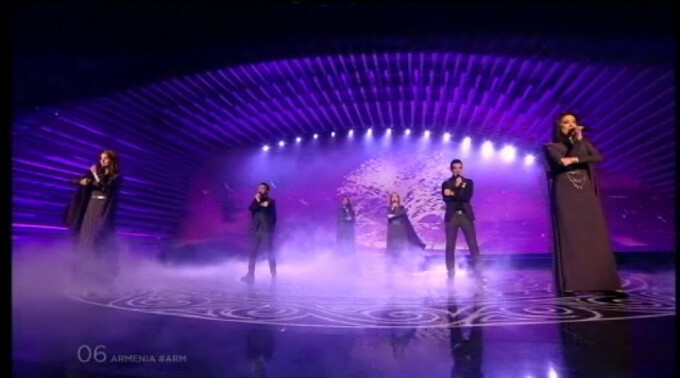 Okay, prepare for a typical song from Azerbaijan - a solid serious entry with epic dancing. 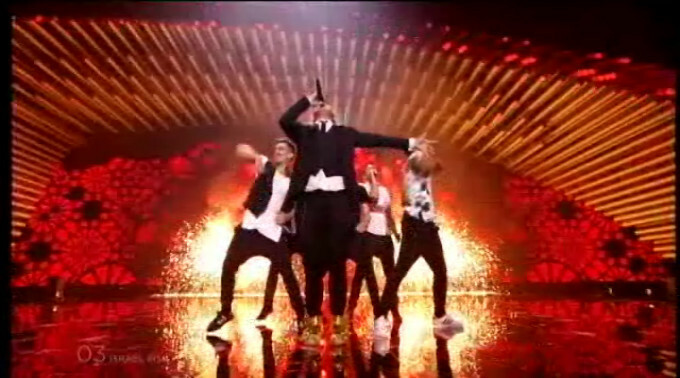 Was it just me or was the singer out of step with the dancers? I'd need to play back the semi final recording to see. Let's see if she is less poop-scared than she looked in the semi final. Oh, yes. She still looks nervous as hell. Maybe Putin has said "bring it home, or else..."? To her credit, she has a powerful voice and a song that she can do justice to. Not to mention a seriously epic dress. Sing it out - this is our final top three placer. And alongside Sweden, this has a good shot at winning it. Plus, cheers and not booing, as Polina tries to keep her emotions under control at the ending. 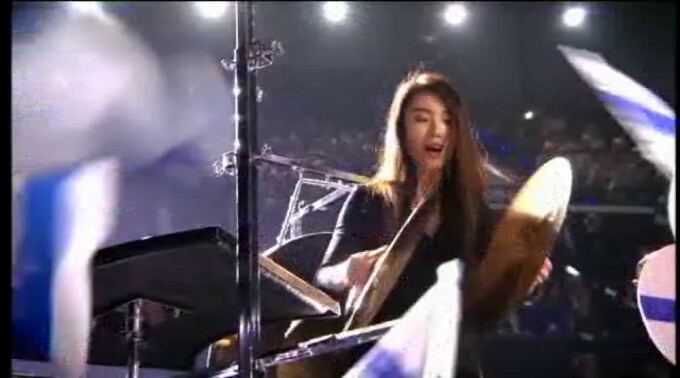 She's kinda cute and carried the song wonderfully. Please, go ahead and puke. Then the "singing" will stop. It's a rather astonishing sound coming from those guys. This is the other song I have on my phone. If you know Simon Cowell's Il Divo, you'll know what to expect. If not, think of The Three Tenors. This is a style that Italy does really well, and being proper Italian just lends "authenticity" (did I just write something so bleedin' obvious?). This is a crowd pleasing piece of epic male power tenorising (I made that word up). There is no justice if this doesn't do well. Guess what. That was the closer. Helluva way to finish. Now come the endless recaps to give us all time to figure out which songs have a hope of voting, and which... you know... don't. As I said, I would hand the trophy to Hungary and consider it a done job. Unfortunately, in reality, as much as I like this song, it is not going to win. This is going to be a three horse race from Russia, Sweden, and Serbia. Personally, I think it may come down to Russia and Sweden duking it out, though I think Russia did it with more gusto. Whether or not politics will get in the way, I don't know. 6 Romania - where have all the parents gone? Sorry Greece, France, Spain, etc. I'm all balladed out. Something very percussive... Then some brass, and everybody making hearts with their arms. Freaky hats that look like bridges, or maybe the mechanism of a clock? I don't know. Yet another reminder that UK viewers cannot vote for the UK entry. Damn, how stupid are viewers? How stupid do they think the viewers are? I went to make a decaf coffee and came back for a recap. I wonder how many recaps I missed? Come on, come on, there's forty entries to provide votes. Okay. The last 60 seconds of voting. Okay. Time's up. Two songs from Conchita to take time while the votes are counted and authenticated. I dunno. 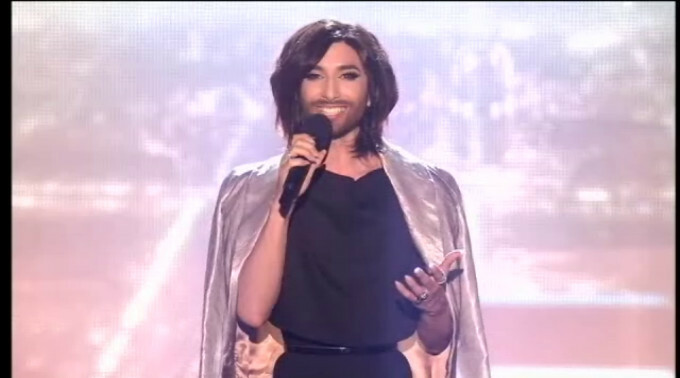 The thing I can't get over with Conchita is the beard. The cross dressing I can take (I grew up with Kenny Everett on TV). He's a good looking guy. He has a really good voice. But... the beard... just causes a brain fart. Conchita leaves us with two new songs (and an album out too). After the songs, a quick chat with Conchita; followed by a brief hi-and-bye from the winner of the Junior Eurovision, an Italian. Whoa, I thought that the Junior version had died a death. I've just thought. Twenty seven songs, only five not in English, so not really much need for the interactive stream for subtitles. It's nearly ten to midnight. Are we supposed to believe the voting will be over in a mere half an hour? That's like a minute per country. Right. Blah blah blah. More awkward yacking, and a video of how winners react when they are announced as the winner. Katrina and the Waves, the last time the UK won. What was that, 1997 or something? Okay. Good. The executive supervisor is saying that the Eurovision Song Contest is now been added to the Guiness book of records for the longest running music programme (or something like that). Are they talking about the contest as a whole, or just tonight's broadcast? This is going on and on and on. And, finally, what we wanted to hear. The results are now in. I'm just going to mention the 8th, 10th, and 12th points votes. There's 40 of these. Real time video links from 40 countries. Hehe, fingers crossed! Montenegro - 8 to Azerbaijan, 10 to Albania, and they'll give 12 to Serbia. Yup. That was predictable. Malta - She's pretty. 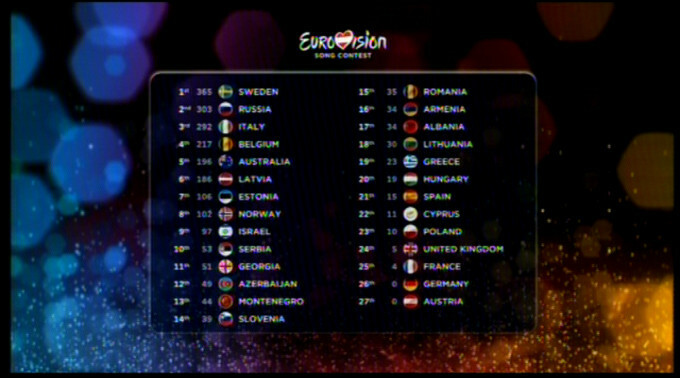 8 to Azerbaijan, 10 to Sweden, and 12 to Italy. Julia Zahra for Malta, and something interesting happening off stage? Finland - 8 to Russia, 10 to Estonia, 12 to Sweden. Greece - 8 to Russia, 10 to Cyprus (only 10?!? ), 12 to Italy. Italy in first place. That's not bad, but I expected Serbia to be doing better. Portugal and... nope. She's gone. Romania - 8 to Sweden, 10 to Russia, 12 to Italy. Italy is now in the lead. Belarus - only 1 for Italy, so... 8 to Belgium, 10 to Sweden, and it will be Russia for 12. Yup. No surprise. Albania - what is he wearing? 8 to Russia, 10 to Greece (her first points), 12 to Italy. Moldova - 8 to Sweden, 10 to Russia (! ), 12 to Romania (their first points - I should point out that Moldovan is Romanian, same language). Azerbaijan - 8 to Italy, 10 to Georgia, and 12 to Russia...yup. Who'd have thunk it? 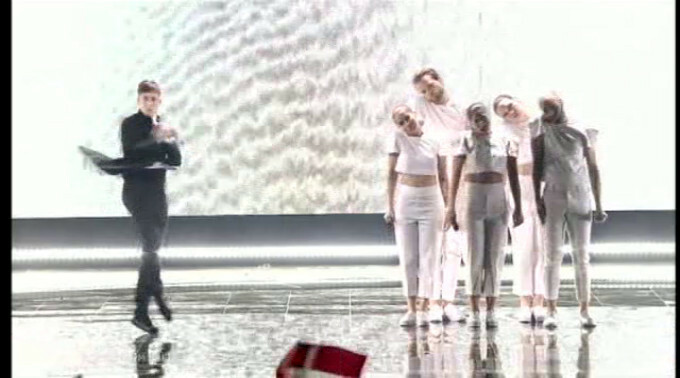 Latvia - more points for Russia? 8 to Italy, 10 to Russia (! ), 12 to Sweden. Whoa, no 12 to Russia. A message from the presenters to say that the music should stand over politics. A bit late to say that now! Voting has been done. Update: Apparently the contest has some sort of advanced anti-booing technology that replaces booing with prerecorded cheering sounds, after the organisers were somewhat embarrassed by the Russian twins being endlessly booed last year. This year, while Russia was cheered after her actual performance, she was being booed by some of the audience as she received points and was in the lead. The message from the presenters was perhaps because the booing was evident in the arena, but this was masked out in the audio transmitted to the world. Yes, Putin is a jerk and yes, he should have left The Ukraine alone. But if a person is going to come to the Eurovision arena and boo a performer, that person really needs to sit down and try to remember why the contest itself was started. Dumbasses. Serbia - 8 to Sweden, 10 to Russia, 12 to Montenegro. Estonia - and... another connection flaked out. Denmark - 8 to Australia, 10 to Russia, and of course 12 to Sweden, yup, that was obvious. Switzerland - she looks like Alizée. 8 pour l'Australie, 10 pour la Norvege, et 12 pour la Suede. Belgium - 8 pour l'Italie, 10 pour la Russie, et 12 pour la Suede! France - un autre francophone, quel surpris!!! 8 pour la Suede, 10 pour la Russie, et 12 pour la Belgique! Armenia - 8 to Montenegro, 10 to Georgia, and 12 to Russia. Yup. Another 12 from a neighbour. Ireland - a single point for the UK to give the UK a pitiful 2. 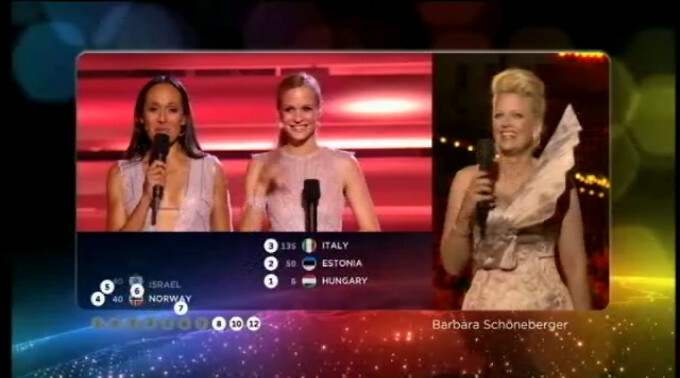 8 to Russia, 10 to Sweden, so... the 12 is... Latvia! Whoa. Sweden - 8 to Italy, 10 to Belgium, and 12 to Australia. The first 12 for Australia from Sweden. Germany - what the heck is she wearing? shouty shouty! Calm down lady! 8 to Belgium, 10 to Sweden, and the 12 to Russia. It's Sweden and Russia. I'm surprised Serbia isn't doing better. Australia - epic cheer in the arena for Australia. 8 to Italy, 10 to Russia, and 12 are going to... Sweden. Yup. And it's strange seeing daylight behind the announcer in a country other than Iceland. We're halfway through the voting. And Conchita chatting with Polina, who is currently in the lead. How does she feel? Crying a lot. Hi to mum and son (over there in the audience). More tears. And now over to talk to Sweden. Come on, come on, come on... Give us the voting! 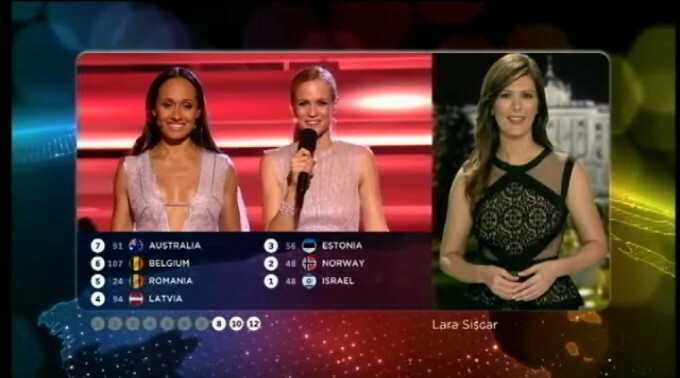 The voting order is generated by an algorithm to keep on the pressure and hide the winner for as long as possible to make the boring voting part more interesting. Czech Republic - 8 to Russia, 10 to Sweden, and 12 to Azerbaijan. Spain - another pretty woman. 8 to Sweden, 10 to Russia, and 12 to Italy? Yup. 12 to Italy. Lara Croft Siscar for Spain. Austria - 8 to Russia, 10 to Italy, so the 12 is to... Australia. They're actually doing pretty well. 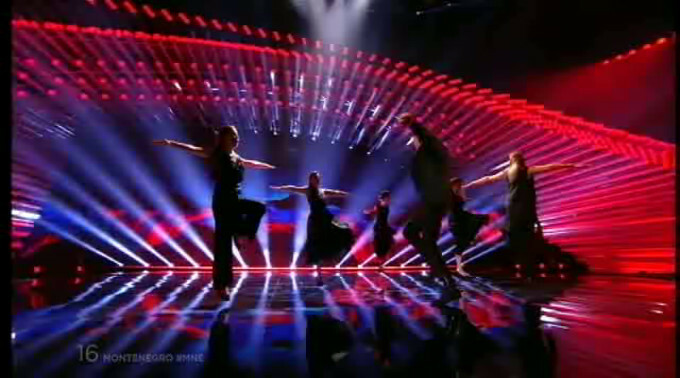 FYR Macedonia - 8 to Slovenia, 10 to Serbia, and 12 to Albania. Kind of random. Slovenia - only 5 to Russia here! 8 to Italy, 10 to Montenegro, 12 to Sweden. Hungary - 6 to Russia, so 8 to Australia, 10 to Sweden, and 12 to Belgium. The United Kingdom and Nigella Lawson. 6 to Russia so maybe more points to Sweden? 8 to Italy, 10 to Australia, et la douze points a la Suede. Sweden is now in first place. Georgia - will they go .... what? Only 5 to Russia? Oh my. Another country that flaked out. This is getting a bit poor. Lithuania - surely some love for Russia here. 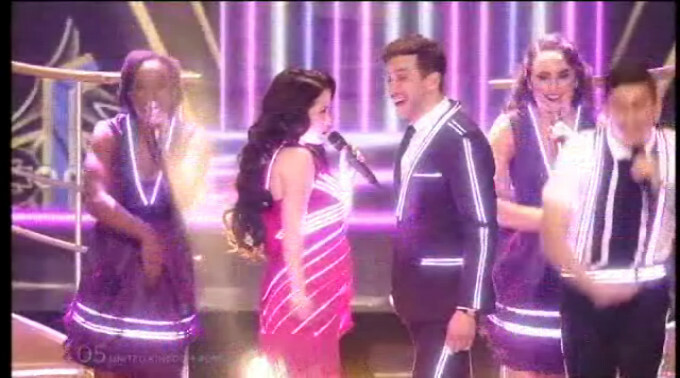 8 to Estonia, 10 to Sweden, and 12 to... go on, say Russia. Oh my. NOTHING for Russia? 12 to Latvia. 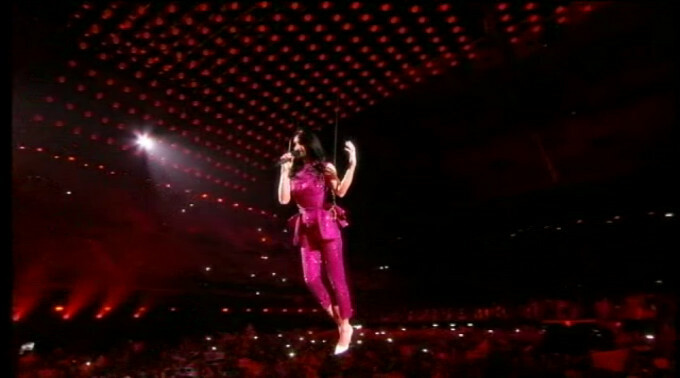 The Netherlands - A mere 6 for Russia and a freaky dress. 8 to Australia, 10 to Sweden, 12 to Belgium. Belgium doing way better than I expected. Poland - 8 to Australia, 10 to Latvia, and 12 not to Russia so it'll be Sweden right? Yup. Sweden. Sweden racing ahead, but ten countries to vote still. Top three - 269 Sweden, 248 Russia, and 212 Italy. Israel - 8 to Russia, 10 to Sweden, so the 12 is for? Italy? Yup. 12 to Italy. Russia - who will Russia vote for? This guy is a Large Ham. 8 to Sweden, 10 to Belgium, and 12 to Italy? San Marino - a huge three points for the UK. Only 7 for Sweden. 8 to Australia, 10 to Italy, and 12 to Latvia. Eccentric voting. And can Sweden be caught up? Italy - 8 to Israel, 10 to Russia, and the 12 will surely be Sweden. Yup. Iceland - ought to be easy points to Sweden. A mere 3 for Russia. 8 to Australia, 10 to Norway, and 12 to Sweden. Can we call it for Sweden? Cyprus - A mere 5 for Russia here, and maybe 12 for Greece here. 8 to Greece? Only 8? Oooh! 10 to Sweden. And 12, to Italy? Yup. 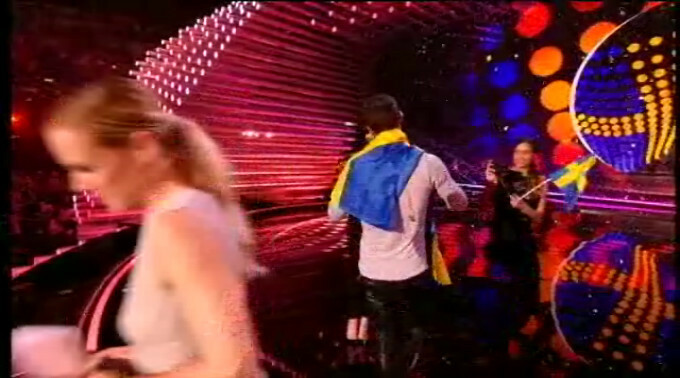 328 now for Sweden, and... nope. We can call it now. 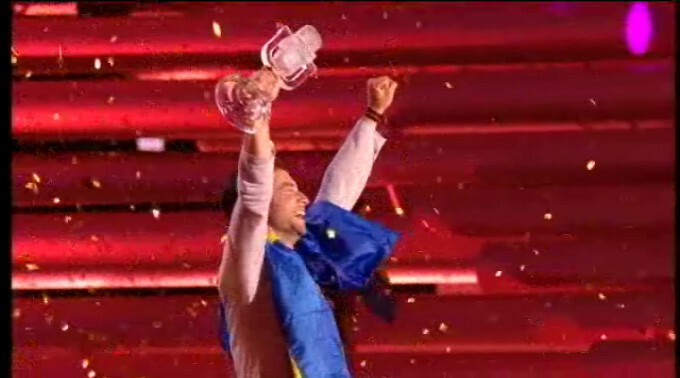 Sweden is the winner. Nobody else can catch up. Norway - A mere 2 for Russia. 8 to Latvia, 10 to Australia, and an easy 12 to Sweden. Yup, so obvious. Portugal - welcome back. 8 to Sweden, 10 to Russia, and 12 to ... so on, say Italy. Yup. It was Italy. Estonia - again. 8 to Hungary (yay! ), 10 to Sweden, and tell me the 12 is for Russia. Yup. Nice, but too late. Still, Polina is excited by it. Georgia - 5 for Russia and 7 for Sweden, so... 8 to Italy, 10 to Azerbaijan, and the 12 to... Armenia. Right. And, look, poor Germany and Austria the hosts. A whole huge nil pwah. Sweden. But we already knew that. I'm not at all surprised by this. I figured it would be Russia and Sweden, but I did expect Serbia's performance to do better. Italy? Yup, Italy was good and deserving of their score. 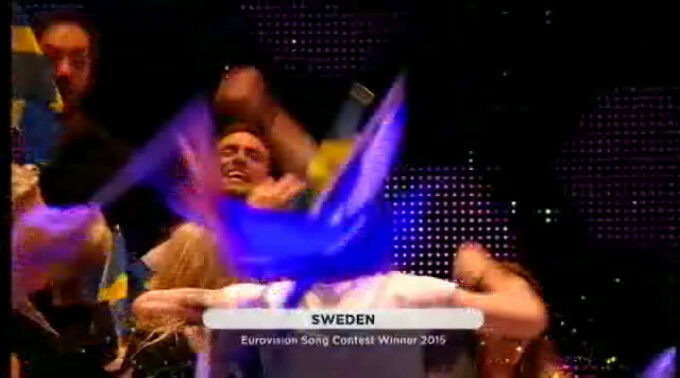 Hehe, and some member of the Swedish team is on the stage recording this on her mobile phone! I feel really bad for Hungary. Such a lovely tranquil song, but I wonder if it really stood a chance against all those power ballads. 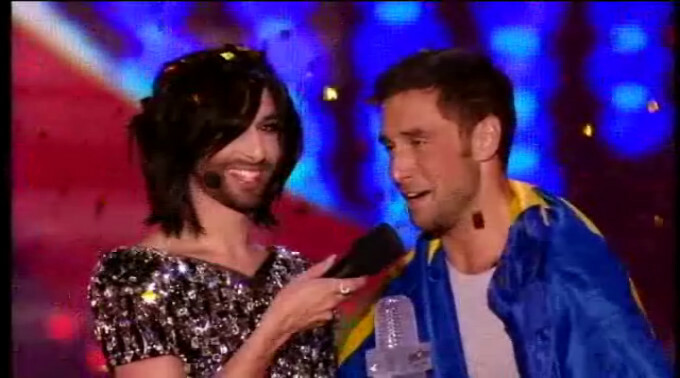 Conchita and Sweden on stage; Conchita asking if the winner had anything to say, and trying to keep a straight face at such a duh! question. Sweden saying we are all heroes. A nice message. 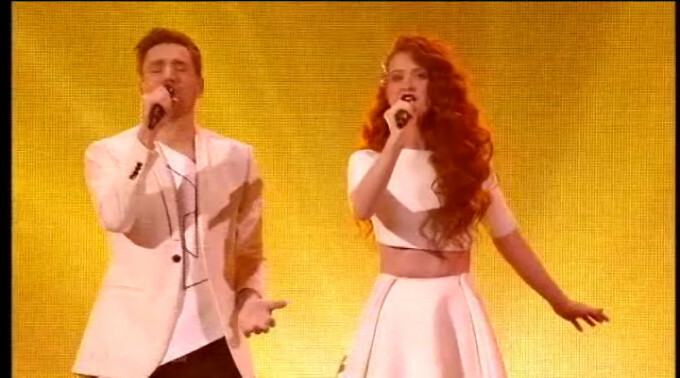 Australia did well in fifth place, and the quirky song from Belgium came in fourth. I'll do some more analysis and pictures and stuff soon. But for now, it's time for a recap of the winning song, and for me to go to bed. I'll update this document tomorrow. A load of ad-libbing while the stage is set up. We're a mere twenty minutes over time. And now the obligatory recap of the winning song. And one last chance to see the video interaction. I wonder how many times we will see people trying to do this next year? Here's how everybody scored. Sweden, Russia, and Italy in the top three places. I wonder how many people are secretly glad the contest didn't go to Mother Russia. There's only so much of Putin wrestling polar bears we can take. Belgium's arty entry and newcomers Australia fill fourth and fifth position. Love Injected is in sixth place. And there's a big gap so we can say "top six" and "all the rest". UK, France, and Germany have definitely lost the mojo and are in their usual positions on the wrong end of the board. Okay, it was a strong year, but really? 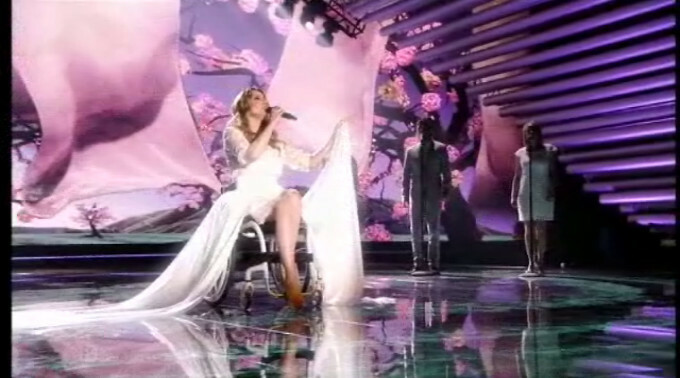 I must say I am surprised that Serbia didn't score higher with her performance. Romania deserved better. And Cyprus failed badly. Maybe this just wasn't a night for quiet songs? Whatever. It's twenty past one. This has run on too long and the final work in capturing the score card blah blah I'm tired, so I'll upload this and bid you all good night for now. 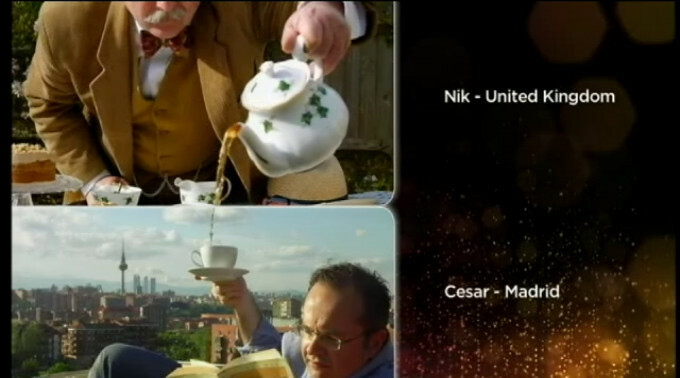 So here I am taking screengrabs to use in this review, and I really really like the Norwegian song. I feel bad for only awarding it four points in my list. I probably ought to have been realistic and swapped it with Hungary. But, oh well, what's done is done. Of course, the pictures are taking a while because I'm rewatching the things I liked. 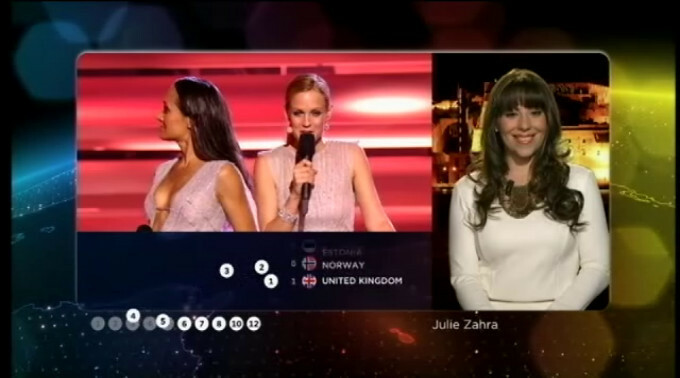 Oh, and that Norwegian girl's dress... She's like a nurse from the future, isn't she? There's no analysis right now. It is half two in the morning (thankfully it is a public holiday tomorrow so I don't have to be up for work in five hours!). I'll up the pictures and go watch Norway again. 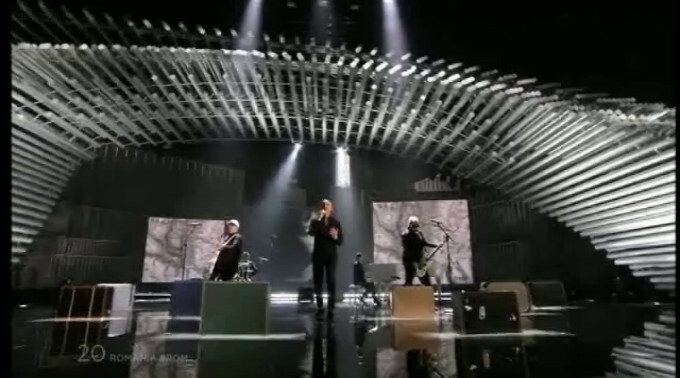 If you want to see the songs again and you didn't record it and you're too cheap to buy the official DVD - then go Google (in video search) for eurovision 2015 <country_name_here> and you ought to get links to the live performance of the grand final (or semis if it failed to qualify) along with the promotional videos. There's also a tonne of other material uploaded regarding the contest, like a brief "making of" the Russian song's video, Boggie's flashmob tour, etc etc. And if you have an Android phone, the Dentex Youtubedownloader (on github.io, not Google Play, for really obvious reasons!) will make it oh-so-simple to download the songs in HD so you aren't stuck with buffering and bandwidth issues.